Why should I prune my trees? What are the benefits? Removing dead, damaged, and diseased branches to helps prevent insects and decay from settling in and harming your trees. Thinning a dense canopy on a tree to increase air and sunlight helps air to flow through and sunlight to reach plants underneath. By allowing air to flow through your trees it reduces the moisture trapped in the branches, lowering the risk of your trees developing a disease or infection. When you remove sucker growth and water sprouts the tree is able to use all of it’s water and nutrients to stimulate growth upwards and maintain it’s health. Correct pruning procedures create and maintain a strong tree structure. The first goal of trimming a tree is to remove the dead and dying branches from the tree. Dead or dying branches are more likely to fail during strong winds or storms. Thinning your tree’s canopy allows air to flow through the tree freely. When air can flow unobstructed through the tree the pressure on branches is relieved and the risk of tree failture or branch failure is lessened. When wood and foliage are wet, it increases in weight four times. For example, a dry branch that weighs 100 lbs will weigh 400 lbs in a rainstorm. This type of pruning and trimming greatly reduces risks during storms. In the forest, trees are crowded near each other and grow straight up to reach the light. This is a tree’s “natural form”, it is taller than it is wide. In urban environments where trees do not have to fight to reach the sunlight, trees grow wide instead of tall. Pruning trees encourages them to grow in their natural form. 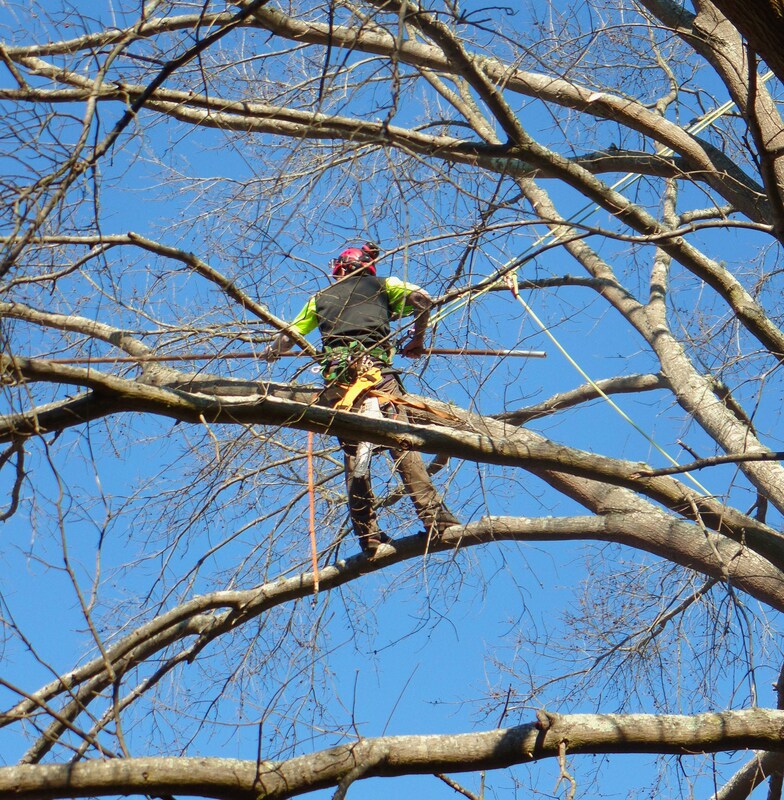 A Certified Arborist has the training and knowledge to know where and how to cut a tree to guide growth in the right direction. Sometimes trees can grow very large in one area and less in another. Pruning can stimulate growth in sparse areas of the tree. By removing dead, dying, or diseased branches the tree is able to produce new growth in that area. When a tree is not stressed by outside forces like disease, insects, or decay it is able to use all of it’s stored energy to produce new, healthy growth. Pruning can also restrict growth where too much growth is undesirable, like over a house, grass, or driveway. When done correctly and with the guidance of a trained and Certified Arborist, pruning can redirect growth away from undesirable locations. Trees are an investment for your home, they not only provide a pleasing view but homes with well-maintained trees increase in property value by 5-20%. Trees in a city often provide an architectural function as well as an aesthetic one. They provide privacy, emphasize views, or block unwanted views, direct pedestrian traffic, and bring a natural element and miniature wildlife habitat to urban environments. Everyone knows that trees help to purify the air we breathe, but did you know they can also lower your energy costs? Trees moderate the climate. Energy costs are typically lower in shaded homes during the summer, trees around homes can reduce air conditioning usage by 30%. Pruning or trimming your trees can ensure the health of the branches that shade your home, giving you the benefit of lower energy costs. Trees also provide a windbreak in the winter making your home warmer. Two trees on your property create enough oxygen for a family of four. One tree can absorb as much as 48 pounds of carbon dioxide per year, that is the amount produced by driving a car 26,000 miles. Mature trees can absorb 70 times more carbon dioxide than a newly planted tree. A single tree can remove one ton of carbon dioxide by the time it reaches 40 years old.